Mount Scott is the highest point in Crater Lake National Park. It is a satellite of the once great Mt. 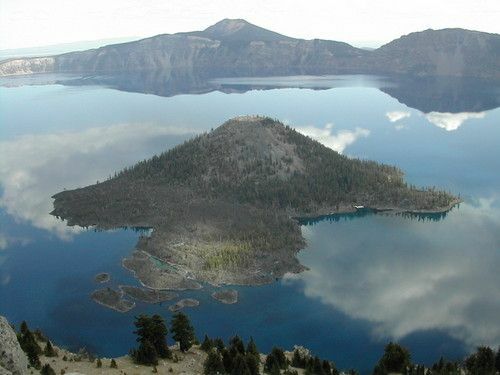 Mazama, of which Crater Lake is the remnant. It's the tenth highest Oregon Cascade peak and its summit is reportedly the only spot you can fit the whole lake into a normal camera viewfinder. There is a manned lookout at the summit. The west side is a glacier-carved cirque while the east side is a fairly uniform slope. I climbed this with Catherine coming back from the AAEA conference in Portland. We had flown up from Sacramento to Portland, but then rented a car for the way back South. After a quick stop at the Mount Hood Winery, we had dinner in Bent and then visited the Crater Lake NP the next morning. The hike to the summit from the parking takes only about 45 minutes. We had the summit lookout) for ourselves for 20 minutes before the second party of the day made it to the summit. Very nice views from the top. We did not have much time, however, because we had to quickly drive to Sacramento that day. This is because on the next day, August 3rd, we went to Incline Village at Lake Tahoe to get married, hehehehehe.